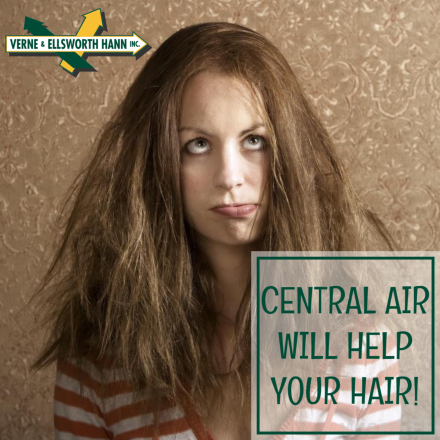 Central Air Will Help Your Hair! It’s summer here in Northeast Ohio and we all know what that means… heat and humidity! If you live in Cleveland and the surrounding area, chances are, you’ve had some bad hair days in the summer months. Humidity can cause hair to frizz, flatten, and become limp and unmanageable. So, what’s the solution? Central air conditioning can help tame those crazy locks! Air conditioning regulates humidity. Cooling systems have an evaporator coil that condenses water vapor from the air. Moist air from your home comes in contact with the cold evaporator coil and then the liquid is condensed out of the air making your home less humid. The evaporator coil collects the moisture which then goes in a drain and is sent outside. This summer, don’t worry about bad hair days…repair, replace or add central air conditioning and start enjoying the comfort of your home and better hair days! Verne & Ellsworth Hann has been repairing, maintaining, replacing and adding air conditioning to homes in Cleveland Heights, Shaker Heights, University Heights, Lyndhurst, Pepper Pike, and most of Northeast Ohio, including parts of Lake and Geauga counties for over 63 years! Owned and operated by brothers Bill and Chris Hann, Verne & Ellsworth Hann is the ONLY Hann family owned heating, cooling and plumbing company in Cleveland. Give Verne & Ellsworth Hann a call at 216-932-9755 or visit our website at VEHbrothers.com. Let us take care of all your air conditioning needs and let us give you better hair days this summer!